For about a week before Rosh HaShanah, traditional Jews across the world started saying “Selichot,” which are heartfelt supplicatory prayers. These supplications are in preparation for asking forgiveness for transgressions committed during the year, with the culmination on Yom Kippur. Those that take such things seriously, which feels like just about all of Jerusalem, say these prayers with great alacrity as soon as the ‘Jewish day’ begins. Consequently, the Old City of Jerusalem, the focal point of all religious Jews in the entire world, has been packed to full capacity every night of the past couple weeks. Everyone from the ‘ultra-orthodox’ that live in the religious neighborhood of Mea Shaarim to middle-class Israelis from outside Tel Aviv to Christian pilgrims from Russia have swarmed the banks, so to say, swelling the high stone walls beyond capacity. From the perspective of a person that actually lives in the Old City, and from the lens of simply being able to walk freely to reach my apartment, this influx can be quite obnoxious. Trying to squeeze past 50 Ukrainians with snapping cameras, every night, makes a person a bit short-tempered. But from the perspective of a person that relishes the importance of Jerusalem, of the holiest city, of all the nations of the world focusing on ‘the eye of the universe,’ these tourists and pilgrims alike are a blessing. Having these Jews and non-Jews come to Jerusalem is nothing more than a confirmation of the Jewish people, Jerusalem, and the centrality of those two living in Israel. What I’m trying to say is that tourism is heartwarming for a beleaguered nation. The spiritual, emotional, and economic boost that these people bring helps to swallow the traffic a bit easier. 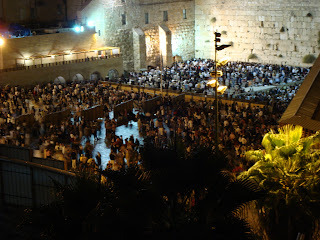 The destination for all these people is the Western Wall, a supporting wall of the Temple Mount. Jews believe that G-d is everywhere, he is omnipresent. However, we also believe he listens more closely to those in Israel, and within Israel to Jerusalem, and within Jerusalem to Har Habayit, or the Temple Mount. 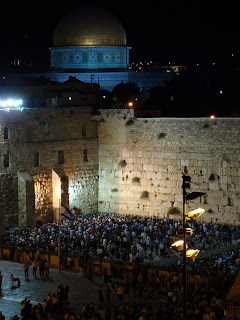 Naturally it follows that the Western Wall, part of this Mount, is a pilgrimage point, especially during holidays. These prayers, the Selichot, following the Jewish belief, will be heard with great compassion and forgiveness at the Wall. 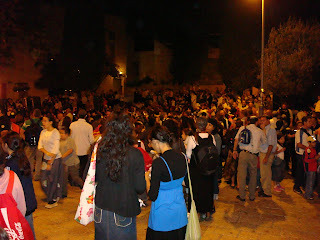 Due to the belief in the centrality of the Temple Mount, the Western Wall Plaza has been packed every single night. There has been probably over a thousand people packed into a relatively small area, crying out, singing in prayer, swaying with their emotions, all the while experiencing self-evaluation next to thousands doing the same. It’s really a very moving scene, regardless how you feel about your own personal self-evaluation. Attached is a picture of the crowd. This one is high quality, so you can click on it, zoom in, and really get a grasp on how many people are down there! Oh, and this view is from my yeshiva (it may be the best view in the world). Earlier I posted a few pictures of the courtyard adjacent to my apartment. The past two weeks this area has been simply packed with Israeli school groups taking field trips to the Old City. They have had speeches here, theatrical demonstrations of Biblical-era Jerusalemites (just like you see a mock Patrick Henry at Colonial Williamsburg), and most recently a concert. The concert is what is in this picture, and all these people seemed to be there half the night. Needless to say, I haven’t gotten much sleep lately.